We are selling this for a friend. Her husband died. He always had the best of the electronics and kept them clean and functional. Battery life may be questionable, since we do not know it's usage. It should be pretty much plug and play with the Zune PC software. The original owner took great care of this Zune and it shows very minimal signs of wear. The screen is near perfect aside from a few light scratches, as is this Zunes body and back panel. 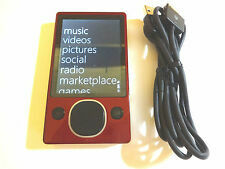 Microsoft Zune 120 Red (120 GB) Digital Media Player. Condition is For parts or not working. Shipped with USPS Priority Mail. MICROSOFT ZUNE BLACK. WE STRIVE FOR FIVE. 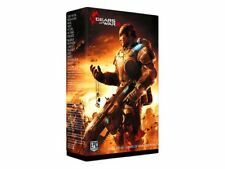 Microsoft Zune 120GB Gears of War. Priced way below actual cost and fees. New HDD, New Extended Life Battery, New Accessories, Original Box. MICROSOFT ZUNE BLACK. NEW BATTERY.A NICE ONe. WE STRIVE FOR FIVE. 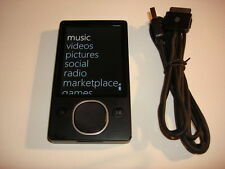 Microsoft Zune 120GB with new battery and 1000's of songs. Don't miss it! 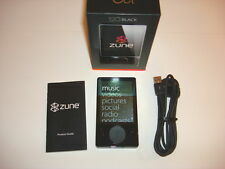 This sale includes the Zune 120GB player ONLY. HARD DRIVE AND NEW BATTERY.A NICE ONe. MICROSOFT ZUNE BLACK. WE STRIVE FOR FIVE. Zune USB Cable. U.S. accounts only. Proud to be Top Rated Plus. 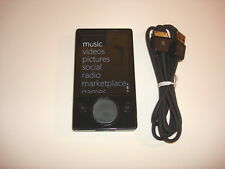 You are buying a Microsoft Zune 80gb MP3 player in great condition (condition 8/10). It is running the latest Zune firmware (3.9) and works great. Don't be fooled into buying a blank Zune that is not updatable or usable. 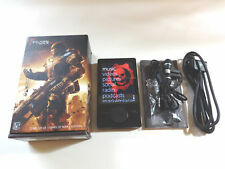 MICROSOFT ZUNE 120GB GEARS OF WAR SPECIAL EDITION. FOR PARTS OR REPAIR. THIS SALE IS FOR A NONE WORKING.